Where do I start? I can’t stop smiling! I’d like to say I don’t know how I pulled it off, but I was there. Luck is a relative term, but I never underestimate what having a bit of it will do for you. This past weekend was the Bushnell Brawl at Rifles Only. I may have come in 2nd place, but it feels like a win for me. 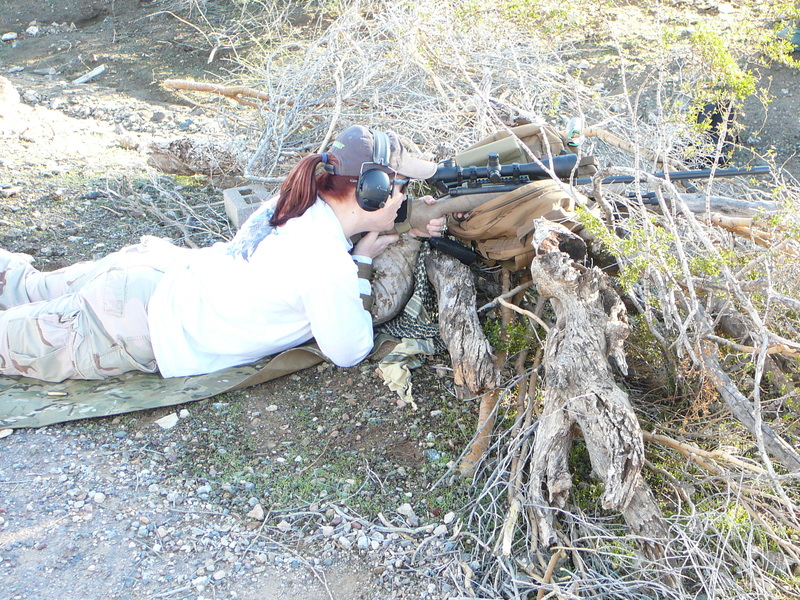 Here’s why… I’ve shot a few matches at Rifles Only. Some have been more challenging than others. The Bushnell Brawl has consistently been one of the toughest matches in the country. This year, the match director and owner of Rifles Only, Jacob Bynum, took it a little easier on us. We shot targets that were either 10” plates or 45% IPSC targets from JC Steel Targets. There were two full-sized IPSCs as well on stages where the target would normally be much smaller. Ya know what? People still missed them. The wind wasn’t as bad as last year either. That being said, it was still challenging. Try your hand at hitting a 10” plate that’s angled away from you from a traditional seated position and see how you do. Unless you’re the one guy who got 8 hits out of 10, you probably thought that was tough! Tim and I flew in a day early to help out with the Production Division match. The Open Division shooters who were on hand were allowed to coach these new shooters, which I thought was a complete stroke of genius. We were all cheering them on, calling out where there misses were impacting, actively helping them get on target. What a great time and an amazing opportunity for both divisions to learn from and help each other out. Ricky Salazar took home the win for Production. He was fun to watch shoot, too! On Friday, all of the shooters were provided an opportunity to check their 100 yard zeroes. Some folks beat feet to the tower for the 800, 900, and 1000 yard stages. I can’t say that I blame them because that’s usually the best place to start at Rifles Only due to the wind picking up later in the morning. I wanted to verify that my zero was good though, so we didn’t end up on the tower until mid-morning. In the meantime, we were able to shoot the two mover stages. One was a 400 yard prone mover. The other was a 400 yard barricade mover. Both were on the same target; one of the aforementioned full-sized IPSC targets. I went 8 for 10 on the prone mover and 7 for 10 on the barricade mover. I had one mental flub and didn’t trust where I thought the bullet went. Why not use the same hold to verify by missing again? Next time I’ll go with my gut on where I thought my miss went. The tower had four stages total. The first three were shot prone. They were 800 yards, 900 yards, and 1000 yards. There was a 10” steel plate at each target distance. As always, I was running a Vortex Razor Gen II 4.5x27x with an EBR-2C reticle. Oh man, did those targets look small! Even on 27x!! It took me a couple of rounds at each distance to get my wind call correct. In some cases, I’d have the call right and the wind would switch, pick up, or drop off mid-string. After watching a few of the shooters before me, including my husband and our good friend, Mr. Paul Reid, I knew it would happen. I watched where they were impacting and measured from what they said they were going to hold to see if I could guess what they’d hold for wind next. My wind hold at 800 yards turned out to be right around .7 MILs. I passed that on to the shooter next to me before it was his turn, he adjusted for his rifle, and he went 9 for 10! Amazing shooting by Ryan Miller, the owner of Ryan’s Range Report! Paul Reid and I thought this would be a good time for a shooting selfie… Especially while Ryan was shooting. LOL! The fourth stage on the tower was a standing supported shot at 500 yards on the other full-sized IPSC. I had a slight issue getting the first round chambered. The time limit was relatively short (1 min for 10 rounds), and that caused enough of a delay that I was only able to fire 9 rounds. I yanked one shot pretty hard but finished the stage with 8 points. I’d like to say that the standing supported stage was one of the “easier” stages in the match, but I’m sure someone found it to be difficult. Matches are weird that way. What is easy for one shooter is challenging to another. I love when stage design plays to many different shooter strengths. Did I mention the match included a helicopter ride?? No? Well it did. And it was awesome! It’s the third time I’ve been able to shoot from a helicopter and they’ve all coincidentally been at this match. The first time I shot from one, I remember being semi-terrified. This time I was actually pretty calm. I was able to enjoy it! I need to remember a GoPro or something for stages like that though! The other stages on day one included shooting off a 550 cord from the inside of a helicopter frame at another 10” plate at 539 yards (that one had pistol as well), the traditional seated stage I spoke of earlier at a 322 yard target, a rooftop stage on a target at 475-ish yards (also had pistol), and the mousetrap (another stage with pistol as well as rifle). After all the shooting was done for the day, it was time to knock some dust out of my action and wipe down my bolt. On my husband’s suggestion, I’ve been using CherryBalmz lubricant for a couple of months and really like how slick the bolt runs with it. Unfortunately, like every other gun lube, it still gets dirt stuck to it, so a periodic wipe down and reapplication ain’t such a bad idea. The best part about shooting competitions, quite honestly, is the people. We went to dinner with friends and had a time to discuss things other than what happened at the match. Well, except for Paul Reid who was one point ahead of me at the end of day one. We had a little bit of friendly banter about who was going to beat who the next day. I went into day two with 83 points; only 4 points behind the leader from what I’d heard. At the safety briefing, we were told that half of the pistol shots for the day were dropped along with a KYL (know your limits) stage. I’ll admit that I was disappointed about the pistol. I’ve never, ever said that in my life either! I hadn’t dropped any pistol shots, so I was thinking those would help me quite a bit. Such is life though. Things change and almost always make for a better match. Voodoo Tactical has new camo called VTC. That’s what this Mini-Tobago is made of. Modular Pump Pillow from Wiebad.com is in the background along with my rifle. We headed over to the Carbine Pit for three combined stages: a 10 round pistol mover, followed by a 6 rounds of rifle off a barricade at 20+/- yards. Five shots were on a 5-dot drill, and the last shot was reserved for a BT Industries ace of spaces card shot (person who shot closest to the center – Kelly Svarstad – won an Atlas bipod!). Once we finished up there, we only four stages left for the whole match and they were all fun! First up was a stage called, “Best Hide Site Ever.” It was based on an actual police involved shooting which made it even more insane to think about. The shooter had to engage a target at 260 yards with 10 rounds while sitting on a toilet! The good thing about electronic hearing protection is you can hear all the instructions from the range officers. The bad thing about electronic hearing protection is that you can also hear the peanut gallery behind you while you’re on the clock! Normally it’s not hard to tune out. For example, I was shooting really well on this stage. I could hear folks talking about the position I chose (which was a brilliant stroke of last minute luck on my part). Then I heard someone say something about how well I was shooting all weekend and that I’d cleaned a couple of stages the day before. My 9th shot went into the dirt just to the left of the target. Doh!! I may have said something to the effect of, “thanks for jinxing me!”… I refocused and hit the target with my last round. In the end it was pretty amusing and I wasn’t upset in the least bit. After shooting from the pot, we decided to go to complete PRS skills stages #1 and #2 because there wasn’t too long of a line to complete those two. These are basically “standards” that every match director will run to break ties. The added benefit will be allowing competitors to track how they’ve progressed through the season. I know I’m interested in seeing if my time and/or hits improve throughout the season! For more info on the skills stages, please check out the PRS rulebook Appendix A-5. The last stage of the match for Tim and I was off of a 550 cord at another target 400 yards away. We both finished well there, and then it was off for a celebratory end-of-the-match cold beverage! Scores came out, but by then there was a lot of buzz trying to figure out who had the high score. I’d already spoken with Morgan, so we figured he’d won but just in case there was a sleeper in there somewhere I was keeping my fingers crossed for him. When Lisa Bynum posted the arbitration scores, she was immediately surrounded (happens at every match). I caught her on her way back to the office and asked her if I was 3rd because I’d heard a gentleman named Dan Davis had one more hit than me. She said, very excitedly and with a huge grin, that I was 2nd! Holy cats! My favorite picture from the entire match is the one below because you can see not only how happy I am, but how happy Lisa is in the background. She’s my sister from another mister and I’m so glad I was able to make her and Jacob proud! I was extremely fortunate to not only walk away with a trophy the size of my torso, but also a new Defiance action! I already shoot for them, so I know they support the sport quite heavily. I credit my equipment (along with a bit of training) with helping me improve quite a bit over the last couple of years. I’m looking forward to building a new .308 with this action so I’ll be able to run it for the caliber specific matches in the series. Trust me when I say they know who won this action! LOL! Some excited texts were sent immediately! My finish is not the highest ever for the AZ crew (Matt LaVine and Michael Nitzschke have both won PRS matches), but it is the highest finish for a female in a national level match. One point away from winning! Really this tells me that I’ve got the right gear, the right support, and I’m doing the right amount of training. I’m winning one this year and you might not want to laugh too hard if you hear me say that in the future. Huge, monster thanks to my amazing husband for helping me with my pistol shooting! I love you more than words can express! Out of 105 shooters, he finished in 33rd place which is phenomenal considering the level of talent in the field. Steph Bostwick and Jaci Janes practicing on the 515 yard mover. I’ll start with movers…. Most shooters will admit that they enjoying shooting at moving targets. What’s not to love after all? The target is moving creating a greater challenge than if you’d shot the same target while stationary and there’s extra math involved! (Disclaimer: I hate math – don’t ask me how I keep ending up with hobbies that involve math.) Once I can figure out my lead on a mover, I usually feel pretty confident. I almost always start with one standard lead based on my reaction time. I’ll see where my bullet impacts and make an adjustment from there. When wind is involved, the lead going one direction may change and not the other so now you’ve got two leads. I’ve heard some pretty good shooters talk about dialing wind and then using the same lead both directions, but with my luck, I’d forget to take the wind off and screw up another stage in a match, so I just use the two different wind holds. One of these days I’m sure I’ll end up at a match where I need to use a negative wind hold. I’ve heard plenty of stories from folks who’ve shot in South Texas and needed them. Then again I think I’d probably love to shoot movers all day long regardless of the conditions. Practice on the mouse trap! The mouse trap and the rat trap at Rifles Only are totally like having a kids jungle gym for adults! These are some of my favorite props at any match anywhere in the country. Now that I have an idea of how to move through them, I love them even more! Honestly, we really were like little kids waiting in line for our turn on a carnival ride. The mouse trap and rat trap at Rifles Only have multiple ports to shoot through that challenge your ability to move quickly, while transitioning from shooting strong side and support side. Some of the ports are stable shooting positions, but they all take some practice! Normally, the shooter is engaging a 2” shoot-n-c target from those ports at around 85 yards or so. The time limit is normally around three minutes for the course of fire with five ports to shoot from with two rounds each. Seems like a lot of time, right? Well, it’s not. At least it isn’t if you actually want to hit your target. Listening as Jacob walks us all through the mousetrap. While some of the ladies practiced running through the mouse trap, the rest of us worked on traditional NRA style kneeling and seated positional shooting. If there is any kind of shooting that I hear people complain about in matches the most, it’s positional shooting. Positional shooting has practical applications as well. The perfect prop isn’t always going to be available and not everything can be shot prone in life, especially if you’re out hunting. Rifles, even ones that have been lightened up considerably, still feel like they gain weight the longer you’re holding it up in the air. Making sure your natural point of aim is on target makes a huge difference. Figuring out how to gain stability while shooting kneeling is hard, but hearing steel ring out when you impact is amazingly gratifying. We spent some time practicing on rooftops on a sweltering afternoon. AZ LRPRS has a few of these and we incorporate them pretty frequently into matches, but we rarely place them sideways to the target or facing away from the target, so it was excellent practice. On the rooftop facing away from the target, I tried all sorts of positions trying to find something stable. I finally ended up using my sling and a small rear bag before I could pull the trigger and know I was going to have an impact on target each time. I believe that position will take a lot more practice to make fluid because right now it seems like it would be a huge time sucker just trying to get a stable sight picture. After two full days of shooting in heat that left each of soaked, we were beat! We still had a match to shoot though, so some of the ladies headed off for showers and naps. Melissa Gilliland and I both headed to the mouse trap to practice dry firing a little more. Melissa and I have been friends several years, so we joked around and helped each other with the choreography since we’d basically be mirror images of each other’s positions (she’s right handed and I’m left handed). All of the ladies shot really well at the club match too! 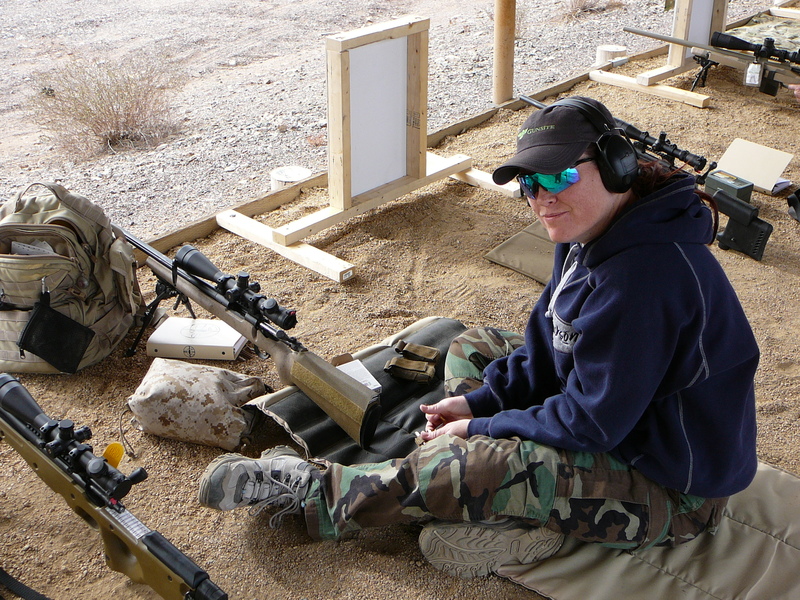 Melissa and I were both pretty focused as we were using this monthly club match as an added training session for the last match of the regular 2015 Precision Rifle Series season. I will say it’s still a little weird to hear people talking about me while I’m shooting. At least it’s usually good things though! I went 9 for 10 on the 515 yard mover and could hear all the chatter in my electronic hearing protection. I ended up winning the monthly match with 55 of the 59 available points. I didn’t make it to the final port on the mouse trap so I didn’t fire two shots there. Not to brag too much but that’s a pretty stellar hit ratio. And I beat a couple of guys I’d never beaten before… Total. Confidence. Booster! (Especially confidence boosting going into a huge match the following weekend.) A lot of credit goes to the phenomenal gear I’m running now. While I shot my .308 for the class, I broke out my brand new 6XC for the monthly match. I haven’t named her yet, but she’s rocking a Defiance Deviant action, Vortex Optics Razor Gen II, Timney Trigger, Manners T4A stock, Hawk Hill barrel, and was built by my gunsmith/guru, Marc Soulie at Spartan Precision Rifles. We’d all like to thank the South Texas Chapter of the Texas Precision Rifle Club for letting us shoot their August club match. And of course, I’d like the thank Jacob, Lisa, Lindy, James, and Corona for having us at the range. I couldn’t have handpicked a better group of ladies to spend a hot, sweaty weekend with either! Steph Bostwick (check out B-Tactical if you’re in the Dallas area), Marie Roberts (Roberts Precision Rifles), Jessie Dussart, Melissa Gilliland, Ursula Williams, and Jaci Janes: my sisters from other misters. Thank you all for making the very first Ladies Only at Rifles Only a huge success and so much fun. #LORO lives on! I’m very hopeful that we’ll be able to kick off another ladies only course in the future, but perhaps when ice water can be drank more than continuously dumped on heads to cool off. If you’re interested in taking a precision rifle shooting class, contact Rifles Only at www.riflesonly.com for more information. 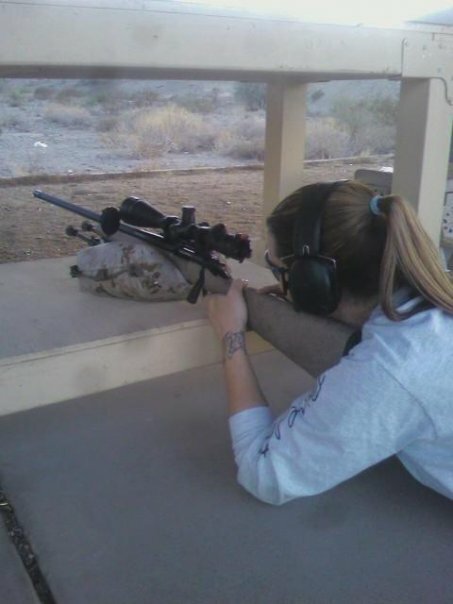 They hold their Precision Rifle 1 & 2 classes throughout the year as well as other courses that may interest you. Their Pro Shop has all kinds of gear as well so their website is sort of a one-stop-shop. If you’re a female interested in participating in a Ladies Only class, please let Lisa Bynum know! Man, I’m asked that question a lot. Every interview, every dinner party, at a new job, a business conference, and even by my hairdresser! Perhaps I just had a really supportive local club when I started out because I’ve never noticed that there was a difference. I’ll admit that the first club match I shot was pretty nerve wracking. I was super new, had zero experience with firearms and a rifle I’d only learned the basics of how to use the day before. I will say that my inexperience ended up being more of a blessing than a curse for me because I had no knowledge of how intimidating this sport could be to some. This is probably where I should share a little of my back-story for those of you who haven’t heard it 100 times already? 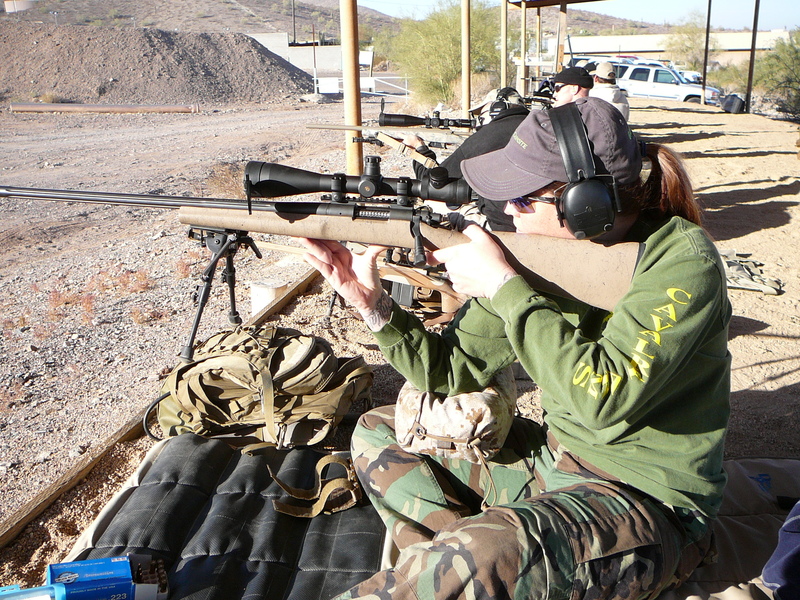 In February 2009, the Arizona Long Range Precision Rifle Shooters (my local club) held a national level match in Phoenix. My brother-in-law, Scott, was the match director. This match would later be known as the Tactical Precision Rifle Challenge (TPRC). I’d watched my husband shoot competitively in several other shooting sports (3Gun, IPSC, IDPA, etc.) and had balked any time he mentioned getting me involved in competing. “Too fast,” I said. “And there are too many things to be proficient at.” So he let it go. Me & my .223 that I named Lyudmila about 10 seconds after my hands were on her. He laughed at me and said, “well, yeah. It’s not that far. It’s only about 400 yards.” I was floored. I couldn’t believe these guys could possibly hit something four whole football fields away. I find my naiveté amusing now, but I sure do remember how impressed I was that these guys were shooting targets that far and hitting them! My newness shows in this picture! My seated shooting has improved considerably since 2010. It took another 8 months before we bought my first rifle; a used left-handed .223 Remington 700 in an HS Precision stock. Tim put a spare scope on it, took me to the range, talked me through getting a zero (which really means he did the work and I tried to understand what he was talking about), and then ran me through a few drills to work on basics. After about 4 hours, he told me I was going to shoot the club’s monthly match the next morning. Say WHAT!?!?! So, I’ve basically been in competitions since I started shooting. November 2009 was my first match and I think I finished in 5th or 6th place. However, all I had to do at that first match was point the rifle at the target and pull the trigger because Tim dialed the scope for me and told me what to do on every stage. It’s good to have a great coach like that when you’re learning something so new and completely outside of your comfort zone. Especially when all the information sort of sounds like it’s coming from Charlie Brown’s teacher! So excited to be shooting my first match! At the next monthly match, all the same guys from the month before showed up to compete, but something weird happened. A couple of the guys I’d somehow beaten walked up to the line with their rifles and gear, saw me, and decided they just wanted to spot and help out instead of shoot. The month after that, those guys quit showing up. Thankfully a majority of the guys in the club weren’t scared of being beat by a woman once in a while and they’ve become my own little dysfunctional extended family. They used to watch their language and sarcasm around me too. That totally doesn’t happen anymore! The tactical precision rifle sport has grown tremendously in the last few years. Much like other shooting sports and firearms in general, it’s grown where ladies are concerned. When I started shooting there were only a handful of women actively competing, and I was one of two who consistently shot national level events rather than just local club level matches. Now there are somewhere around 25 ladies shooting on national level circuits including the Precision Rifle Series. Match directors won’t always recognize a top female at their event but our numbers haven’t exactly supported having a specific award just for us… yet. Personally, I don’t really care about a top female award. Don’t get me wrong; I’ll take the High/Top Lady awards any chance I get, but that ain’t my goal. I want another top five, or even better: a 1st place trophy! Perhaps I haven’t noticed a difference because other competitors and match staff have always treated me like I’m one of them: a competitor. I can’t remember a single time when anyone at a match treated me differently than they treated each other. So what’s it like being a female in a predominately male sport? My answer is this: it’s not any different than I suppose it would be for a guy. Do You Even MD, Bro? gpkon66 on Do You Even MD, Bro? Kerry Adams on Do You Even MD, Bro? Kelly S on You Asked So I Answered.